Israelis were not allowed to cross into Egypt through the Taba border crossing on Sunday; Egyptian newspaper said Israel closed the border. 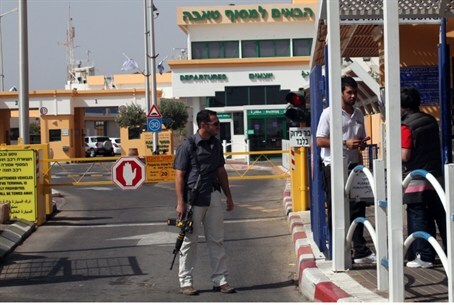 Israelis were not allowed to cross into Egypt through the Taba border crossing Sunday morning, although foreigners were able to cross through as usual, as was any Israeli who possessed a foreign passport. A source at the crossing told a reporter that the crossing was “probably” closed to Israelis due to terror alerts. Although thousands of Israelis still visit the Sinai Peninsula each month, both the U.S. and the Jewish State have warned citizens not to go. Numerous terrorist organizations have established bases in the area over the past year, and there have been “credible terror alerts” in recent days, according to intelligence sources. Israel's counter terrorism bureau warned Israelis over the weekend not to visit the Sinai Peninsula, with a banner hung at the Eilat-Taba border, warning citizens not to enter Sinai resorts. According to the Egyptian daily newspaper Al Ahram, however, the Israeli government later decided simply to close the border completely to Israelis, not allowing citizens to pass through into Sinai due to the extreme danger involved. The U.S. embassy in Cairo also issued a warning statement Sunday asking its citizens not to visit Sinai for fear of terrorist attacks. A similar alert was posted by the U.S. Embassy in Tel Aviv, telling citizens to “exercise caution” while traveling along the border with Egypt.